From the time a man is born in an Aztec family, his path is predestined to be that of a warrior. Symbolically, the baby boy’s umbilical cord is given to a warrior. The warrior then buries the cord in a battlefield, and this in turns sets a path for the Aztec man in the future, the ritual confirms that the Aztec boy will grow form a child to a man, and a warrior. As a young boy, the Aztec child follows his father to learn how to hunt and gather food and follow his father’s footsteps. Hunting was important in Aztec times, with large portions of the day dedicated to it and boys would have to become adapt to provide for their family and community. The Telpochcalli or ‘House of Youth’ offered warrior training, and this would have to be attended. Aztec Boys would also go to Cuicacalli School to prepare them for service like a military school that would. Boys from noble families have the alternative to go to a monastery called Calmecac to be trained by priests. Religion was a big part of the Aztec culture and priests were important guides to how they live their everyday lives. It was the priests that offered human sacrifices to the gods to protect humans from the wrath of the gods and to win their favour for blessings. More privileged Aztec boys would learn about astronomy, art, and history, or even how to govern and lead future Aztec generations. The wealthier their families were, the higher their positions they would typically attain in government or even in the military. Around the age of 20, men would usually take up a wife to help him around the house, especially when he is away at war. The Aztec man may also have secondary wives, but only the primary one would have the privilege of a grand wedding ceremony, the future wives would have to settle for less. As the Aztec man grows up to be a father himself, he takes up the responsibility for providing food for his family, the training in earlier life serving them well in the hunt. It was also commonly known for the Aztec man to discipline their children in some harsh manner if required, even stabbing them or tying up the child’s hands and feet, if they deemed it necessary. Most of an Aztec man’s time was spent at war, and they were good warriors. Aztecs were obligated to protect and fight for their tribe and family, and they engaged in war to widen the reach of the Aztec Empire. To earn the respect and elevate one’s status in society the Aztec man could gain this through heroics in war and was sometimes measured by the number of captives they would gain in battle. It is in fact an amazing historical feat how the Aztecs rose to power from around the 12th century A.D. until around the 16th Century and became a large empire with a population reaching about 250,000. 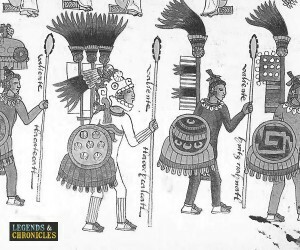 If the Aztec man was not fighting in the battlefield he might be farming in champanillas or building tools like weapon making. Other Aztec men choose to become a doctor, priest, merchant, leaders, or a tribe governor, but the highly glorified status of the warrior was the most sought after profession for most Aztec men. Another occupation that was an interesting choice for an Aztec man was being an Athlete. The Aztecs had a game called Ulama and the players were popular and considered local celebrities, enjoying social status through their athletic prowess. The word ulama comes from the Nahuatl word ollamaliztli which roughly translated means rubber ball, and is in fact one of the oldest sports recorded to use a rubber ball. It is well noted in the Aztec’s architectural history that there were ball courts built for this sport, and examples of these can still be seen in Aztec remains today. 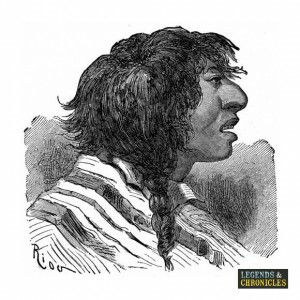 The Aztec man was born into a way of life, they would be considered warriors in the making from an early age with rituals to re-reinforce this path. Of course, this was not all they would become, the Aztec’s believed in many things and some would study history and art, becoming adapt at these and many other skills too. Religion was of course another option, and even life as a local Ulama athlete was a choice should an Aztec men have the necessary skills and agility. In summary the Aztec man has some choices in his life but they were rather limited, war was a big part of his life, and it was important for an Aztec man to be good at it.